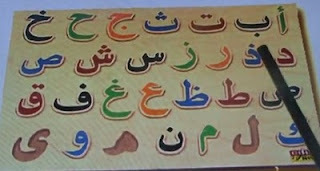 An early start this morning and no time for a proper blog entry, so here’s a link to a jolly song to help you learn the Arabic alphabet (or “abjad”). 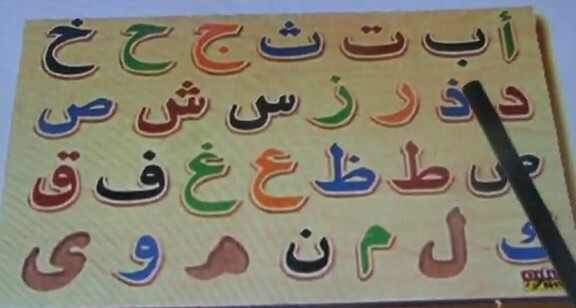 You can also clearly hear the effect of the "dark" letters ص, ض, ط‎, ظ, ر‎, خ, غ, ق‎ (apologies about the jumbled order there; should read Saad, Daad, Taa, Dhaa, Rayy, Khaa, Ghain, Qaaf), which change the first vowel from æː to ɑː as discussed a few weeks ago under ElBaradei. sˤɑː sˤuː sˤiː for Saad. No, it was not سا سو سي, it was سَ سُ سِ emphasized so that the short vowels appear long. And the effect of the dark letters is clearly audible. And my OPEN post has been deleted (for a good reason, I know). what's the difference between سا and سَ "emphasized so that the short vowel appear[s] long?" I noticed interesting differences in the child's pronunciation of the dark/emphatic letters. They're markedly less "dark" (and it's true, you notice it especially on the following vowel.) In some cases the saad is barely distinguishable from the siin (to my ear). So John, or someone else: are pharyngeals "marked" in some way that make them a little harder for kids to learn? On one hand we're taught "every kid learns his/her language easily and perfectly" and "no language is really hard for a child"; on the other hand, this seems like a bit of evidence that some things really are a bit hard for the nippers. (This is all by way of trying to excuse how long it took me to get those consonants right). My guess would be that the kid just has a different accent. The weakening of pharyngealization is reasonable even for native speakers, just as is the weakening of ejectives or any other features that exert extra energy.